Here's another one from the new scanner. 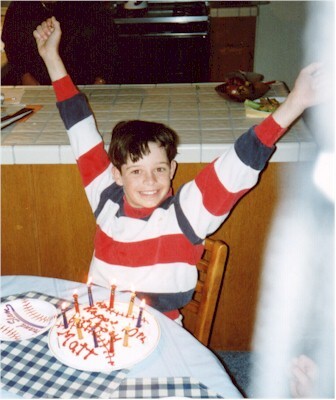 This is Matt's birthday in October of 1996. Bayley, our dog, got spayed today. She's not a happy dog, and needs to wear a big plastic cone collar for a couple of weeks. The vet gave us some drugs to ease her pain, and we're keeping an eye on her to make sure she's okay. The cats have been quite interested too. Sometimes it seems like they're consoling her.